Back in June I received my Riutbag R15 and i have been using it as my go-to backpack ever since. Riutbag are a company descended from a Kickstarter to make a backpack which is only accessible through the back panel, meaning that it is extremely theft-resistant when worn. The company states that Riut is pronounced “riot’ and stands for “revolution in user thinking.” This is probably the only thing I really dislike about this bag, as it feels excessively wanky and corporate for a company which started out as a Kickstarter. The bag appealed to me for two reasons; firstly I frequently travel for work and I am often unsure of what to expect with regards to petty crime in the places I visit and secondly, the bottle pockets looked perfect for my Klean Kanteen Insulated 591ml which I usually have with me. Since June, in addition to numerous day trips in the UK, the Riutbag has come with me to Kunming in China, Copenhagen and various cities (and crappy industrial towns) in Japan. Other than finding it unpleasant to wear when severely overloaded (two laptops, 500 ml water and work tools) I have been extremely happy with the bag. The outward facing side is plain, but does not draw unnecessary attention to its unusual design. The bottom is a waterproof plasticy material, so that the bag is less likely to absorb water if put on wet ground. When taken off, the back panel can be unzipped and folded out. There is also a small pocket at the top and two small pockets in the straps. The pockets in the straps are a bit of a disappointment because the contents are on the wrong side of the strap padding, so anything hard will dig into your body. The R15 has a bottle pocket on either side (other than capacity, this is the main thing distinguishing it from the R10). Unlike most backpacks, the bottle pockets take space away from the inside of the bag, but they give the bag a certain sleeknesss which it would otherwise lack. The recessed bottle pocket design also retains the bottle very well and as mentioned earlier, will comfortably fit a 591ml Insulated Klean Kanteen bottle (the 946ml will also fit, but is a bit tight). The R15 is not a massive backpack, but it is large enough to be a practical day-pack for me. Shown here, the bag has a coat, jumper, headphones, 3DS, 13-inch laptop, bottle and numerous other small items in it. At the back of the main compartment are two mesh zipped-pockets for small items. The back panel is well organised, with two open pockets (the large one has retaining straps for a laptop, so it would not slide out when the bag is opened up like this) and a smaller zipped pocket. The zipped pocket has a small business-card sized pocket inside it. The outside of the middle pocket has pen holders. The R15 construction is very good. It mostly consists of a mildly padded, thick Cordura type fabric, with some neoprene also used where appropriate. There are some really nice details, such as the elastic loops on the end of the straps which allow any excess strap to be folded away rather than left dangling. There is a small loop on the top of the bag which I assume is designed for hanging the bag from a hook, due to the presence of a much larger, padded handle adjacent to it. The design of the bag is updated based on user feedback, if you were to order an R15 today, it would not be quite the same as mine. As this is primarily a cycling blog, I have tried cycling with the bag on whilst on a hire bike in Copenhagen. The R15 is not any worse to cycle with than any other backpack, but of course under most circumstances anyone who is not extremely silly would use pannier bags to carry stuff when on a bike. Based on the past five months, I would recommend the Riutbag R15 to anyone looking for a versatile and secure day-pack. A few years ago I read about a swiss army knife designed specifically for people who work with PCs, which included a small bit driver for the various small phillips and torx screws used on motherboards and in laptops. When I started thinking about getting a swiss army knife, I remembered this and I was pleased to find that not only does it still exist, there are a few different versions available in the Victorinox Cybertool range. The bit driver is also available in some of the larger Swisschamp models too (XLT, XXLT, XAVT). For me the Cybertool 34 (CT34) offered the best range of tools within the size range I wanted, without having too much redundant overlap with the Surge. Both the CT34 and Surge have bot drivers, with some overlap in the supplied bits, but I would be much happier using the CT34 above the likes of a delivate motherboard than the Surge. Similarly, I prefer the Surge when working on things at a larger scale. The CT34 is available with translucent red or blue scales. I damaged the scales on mine (and never really liked the translucent scales either) so I decided to replace them with black. The CT34 buts are 4mm hex, with a ball bearing on one side of the bit to retain them in the driver/holder. The holder only makes contact with the bits on two sides, so it is important to ensure one of these sides make contact with the ball bearing to prevent the bits falling out of the holder and the bit driver will also act as a 4/5mm nut spinner when empty. The bit selection includes #8, #10 and #15 Torx drivers, #0, #1 and #2 philips drivers (will also double for Pozi drivers in a pinch), 4mm hex driver and 4mm flat-head. In a pinch, the #8, #10 and #15 Torx drivers will also happily double up as 2, 2.5 and 3 mm (respectively) hex drivers too. The bit driver is what really makes this tool, and brings the whole Swiss Army Knife concept into the 21st century. I believe that the special bits are made by Facom and compatible alternative bits can be found in their catalogue. The CT34 has a few features which the Surge lacks; the scales contain a surprisingly useful pressurised ballpoint pen, tweezers, toothpick and a pin, in addition to an eyeglass screwdriver which lives wound into the corkscrew. I wouldn’t want to write a lot with the pen, but it does often come in useful for writing down a quick note or marking something up. The toothpick is great, and it is possible to buy replacements once it gets to the point where you want to retire it. Other tools unique to the CT34 are the corkscrew and hook. The corkscrew is not really that useful unless you tend to drink a lot of wine outside. The hook is rated for to almost 100 kg, which opens up some possibilities (zip-line, anyone?). Like the Surge, the CT34 also has two blades and pliers. Unlike the Surge, the blades are both non-locking and neither are serrated (the Surge has one straight and one serrated). The blades hold an edge very well, but because if this they require a bit more work during their (admittedly less frequent) sharpenings. The pliers are sprung and much smaller than the Surge pliers; they are ideal for small detail work which makes them a good compliment to the Surge pliers, rather than redundant. They also include wire cutters (only really good for small gauge wire) in the jaw of the pliers and a crimper in the arms. The remaining tools are duplicates of the tool selection available on the Surge, and include the following: A can opener (with a useful small flat head driver) and a bottle opener (with large flat head driver/scraper/pryer & wire bending notch). Sharp awl with eye for thread. I like this awl better than the Surge awl, and I have made some holes in wood with it when there was no drill available. The tools in Swiss Army Knives are held in place using back-spings. These keep the tools folded away when not in use and give the tools a satisfying “snap” when opening/closing. The main disadvantage of the back-spring mechanism over the Leatherman is that most of the tools require fairly long and substantial nails (or some sort of substitute) to get at, whereas the tools on the (admittedly less sleek) Leatherman are easily accessible without using nails. I get around this by using the tweezers from the scales to open the tools which have nail nicks, and the use of nail nicks does make for a much smaller overall package when compared to the likes of a Leatherman. At the time of writing I am in South China and I have managed to grow my nails a bit due to the fact that I have stopped biting them whilst I have been here due to the generally less hygienic conditions here (e.g. public toilets with no hand washing facilities, non-drinkable tap water etc.) and the nail nicks are working just fine for me at the moment. Much like the Klean Kanteen bottle and Leatherman Surge I have reviewed previously, I have become rather attached to the Cybertool 34. I think part of this is due to having these things with me so much of the time and enjoying the various benefits they bring. This is especially true for the things I have with me when I’m travelling abroad on my own. Whilst it is smaller and therefore less capable than the Surge, after nearly eight months of carrying it with me most of the time I am very happy with the CT34. Paired with the Surge there are not many jobs which cannot be tackled. The CT34 is also a very capable tool in its own right, without being too bulky to carry around all/most of the time (although if you are going to have just one tool of this sort, the Cybertool 41, with the addition of a wood saw, metal saw, file and chisel may be a better option). It is hard to know what tools might be needed in an unexpected situation when you are out and about, whether on or off the bike. Multi-tools can be a useful way to stay prepared without the impracticality of carrying a selection of individual tools around with you. A T-shank adaptor compatible with either the file or saw provided, or any other blade with a common T-shank end. Pliers including replaceable wire cutting/stripping blades and two crimping cut-outs below the pivot. An awl, large and small flat-head screwdrivers. In addition to this, my Surge came with a leather pouch which can be worn on the belt. This is useful as the weight of the Surge is a bit too much to be comfortable in trouser pockets. The build quality is really quite impressive. There is no play in the pliers or any of the other tools, the tools are made from an appropriate grade of steel for their intended purposes and the blades are designed in such a way that their edges do not strike or sit in contact with the housing when folded away. Sadly, in the UK at least, the Leatherman Surge is not a legal carry item for most people because it features two locking knife blades. Whilst there are exceptions for those with a “good reason” for carrying one, such as profession, the vagueness of that clause could lead you to think that you’re safe whilst actually falling foul of the law. Because of this, and the absence of an adjustable spanner, I would not recommend the Surge as a multi-tool for cycling purposes. However, I would recommend it for anyone who would benefit from having a really good general purpose multi-tool. It’s been over a month now since I bought my new-to-me Brompton, during which time it has been used extensively. I feel I have now had enough experience with it to do a proper review, you can read my initial impressions here. The main event when looking at folding bikes for many is the fold itself. As is shown in my original post, the fold is neat and compact and the oily chain is tucked away in the centre of the package. Unlike most other folding bikes I’ve used, it doesn’t try to come unfolded whilst being carried, which is one of the best aspects of the design. Once you have got the hand of it, you can fold the bike in little more than a few seconds, with unfolding taking little longer. This is ideal because although the folded bike is compact and forms a sturdy package, you wouldn’t want to carry it folded up for any serious distance. There are lighter options available, but realistically even they won’t make carrying the folded bike for any length of time much more pleasant. 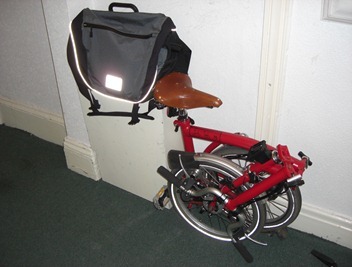 I have ridden the bike over reasonable distances on several occasions (several trips from Macclesfield to Manchester), and the compact and clever folding ability of the bike does not diminish the ride. The wheel-base makes the bike feel like a much larger bike when ridden, which gives a better experience than many of the other folding bikes I have tried. The ride quality is similar to the Raleigh Twenty, although the steering is a bit more twitchy at lower speeds. The M-type bars give a reasonably upright posture, although the fact that the seat-tube does not terminate at the bottom bracket means that the virtual seat-tube angle gets steeper with saddle height. This can be corrected to a certain extent by moving the saddle fore/aft. The stock gearing is reasonably broad, although a wider range would be desirable, and is available in the form of the 3-speed hub & 2-speed derailleur-equipped 6-speed Brompton, or even just the BWR wide range 3-speed hub. 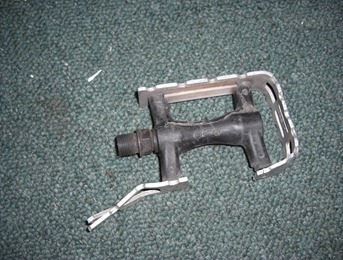 The left folding pedal is great, but the non-folding right pedal is less impressive, requiring replacement a few week after I purchased the bike. I never used the stock-saddle, but it looked like it was designed for the S-type Brompton rather than the more upright posture of the M and P type bikes. It also didn’t look particularly lady-friendly. The caliper brakes are good enough, although the back brake seems to offer more power than the front, which I believe is an oddity of the Brompton in general, not just mine. I am thankful that the model I got was new enough to have the dual-pivot Brompton brake, which is reported to be a lot better than the old single-pivot model. After a few weeks, I decided to take the plunge and fork out for the Shimano dynamo wheel before the price increase. The dynamo hub is great, it produces a reasonable output in the lights at walking speed without noticeable drag. Sadly I had to sacrifice the front dynamo light on the Yuba due to budgetary constraints, but with a little hammer adjustment, the Lyt can be used with the Brompton without interfering with the luggage system. Overall I would recommend the Brompton to anyone. If you only wish to own a single bike, this could be it. It is remarkably versatile, being able to carry a decent load in a wide variety of high quality proprietary luggage options, cover longer distances well, offering a comfortable riding position (although it is no roadster), reliable hub gearing and on top of all that if folds into a neat package, opening up new opportunities to cycle when travelling by bus, rail or air. 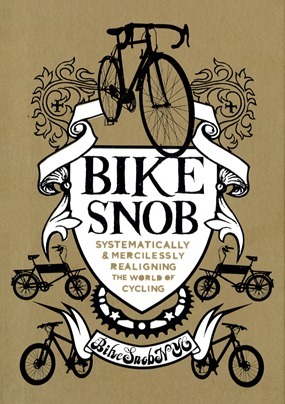 As a long-time reader of the BikeSnobNYC blog, I decided to snap up a copy of Eben Weiss’s book, “Bike Snob,” whilst at Waterstones a few days ago. The book is an enjoyable read for anyone who is already a cyclist, the Guide to Cycling Tribes section will no-doubt bring a smile to anyone who spends a reasonable amount of time in the saddle. The book, in parts could persuade a non-cyclist of what those of us who do cycle get to experience when we ride, from the obvious advantages of cycling as transport in dense urban locations to the less practical aspects of cycling which can be troublesome to articulate to our non-cycling friends. Whilst this blog is not particularly concerned with sport-cycling, Weiss describes the enjoyment which competitive cycling brings him in a way even the most utilitarian cyclist can appreciate. The book has a very American flavour to it, which is to be expected as it was written by an American. In terms of transport policy, particularly the relationship between motorists and cyclists we in the UK are much closer to the USA than most of the rest of the European countries, sadly. This is in part due to Britain being resistant to some of the best things the EU has to offer. Cycling as transport is inferred throughout the book but rarely specifically mentioned. The problems with motorists brought up in the book will be instantly familiar to anyone who has ridden a bike on the road in the UK. Weiss is known to be pro-helmet but takes the moderate approach of saying that “If it’s between riding a bike without a helmet and not riding a bike, you’re better off just riding the bike,” which I can respect, although my personal view is that if it is a choice between riding a bike with a helmet and not riding a bike, you’re better off riding with a helmet. He also points out the folly in relying on a helmet instead of things such as your brain and in the case of hipsters, brakes and does so in a moderate manner which is unlikely to alienate readers with different viewpoints. This book could make a great Xmas gift for an experienced cyclist but the talk of pain and traffic danger could be off-putting to a non-cyclist you are perhaps hoping to inspire, which is a shame considering some of the positive, inspirational content of the book. Overall I would definitely recommend it. Regular readers of this blog will know that I have replaced my Kona Africa Bike with a Raleigh Tourist De Luxe. The Kona is currently awaiting a bit of maintenance and a clean-up before eventually going onto eBay. I used the bike every day for about 3 months and was generally happy with it, but decided that a Tourist De Luxe at the price I saw mine at was too good to pass up. I have decided that the Africa Bike deserved a second review covering its use over a longer period of time than my first review. 1) The original single-speed gearing was very pleasant to use and didn’t give me any trouble, although it made riding longer distances and climbing hills more tiring. 2) The replacement Nexus 3-speed gearing was excellent, with enough range to increase the distance the bike could comfortable cover. I particularly enjoyed the ability to gear down when stationary, along with the general smoothness and reliability of the transmission. 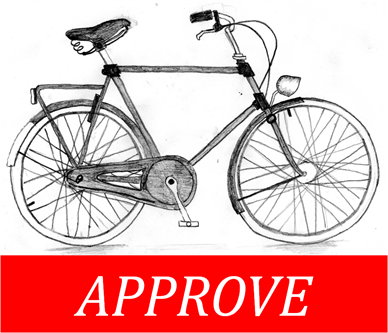 3) The coaster brake. Both gearing systems came with a coaster brake, the first one I had used since being on holiday in Germany a few years ago. Coaster brakes prevent you from back-pedalling which can be annoying when setting off, however the advantages of the coaster brake is in its simplicity, essentially being a chain-actuated drum brake. It was quite liberating to be able to slow down gently when approaching traffic lights or to modulate my speed without the need for a brake lever. I feel there is something quite intuitive about coaster brakes and may put on on the Tourist if I ever convert it to a 5 speed. 1) The basket. The folding basket was brilliant, it made me appreciate baskets in general and I liked being able to carry a few things within easy reach and sight. The problem with the basket was that it squeaks, a lot. The squeaking got worse when two of the metal wires which make up the basket snapped. This happened within 3 months of use. 2) The rear rack. Whilst it was sturdy and I agree with the rationale of integrating it into the frame, the tubing was thicker than that on my Yuba, at around 20 mm it made carrying most panniers impossible. 3) The frame geometry. The bike was comfortable to ride for distances less than about 25 km, after which it became uncomfortable, mainly due to the difficulty of putting power down onto the pedals. This was a result of the hybrid frame geometry; mountain bike like seat and head-tube angles but with higher and closer handlebars. This means that your quads do all of the work, all of the time. For me this meant riding more than 25 km started to get uncomfortable, although I did manage over 50 km on it a few times. The Kona Africa Bikes (One or Three) are ideal bikes for people who want to make journeys of about 15 km each way at the most. This probably covers a great deal of what most people want from a bike, and probably all of it for some people. As I found myself wanting to travel further by bike, whilst remaining upright, I decided that this wasn’t the bike to do that on. The bike has many good qualities and hopefully it will end up with a new owner who it is fully suitable for. 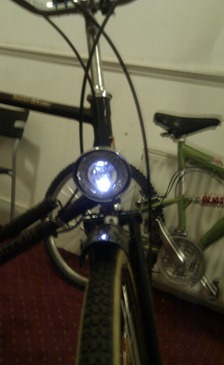 Last night I took the new dynamo light out for a spin. It was around 8pm, so not dark but getting there, and ideal time to test out the sensing ability of the lamp. I first put the light onto the “1” (always on) position and found that it was not coming on consistently. I then decided to put it into the “S” (automatic) position and found that the light was still not always on, but seemed to be on more often. At first I was concerned that I would have to go very fast to get the light to work well, seeing the beam come on and then go away was a bit worrying when I was teetering around the 20 km.h-1 mark. I later managed to get a look at my reflection in the parked cars and realised that the light was always on, but when it was light enough it just illuminated the small “be-seen” LED portion of the lamp and when I went it was coming on full beam it was because of the dip in light level. The stand-light provides enough light to be seen by other road users when stationary. I am assuming that on my (maybe all of them) lamp the “1” and “S” positions are reversed, but that even when set to always on the lamp uses the sensor to determine what level of light is needed. I quite like this idea because it will increase the length of time between halogen bulb replacements. Like most aspects of dynamo lighting, it would have been nice if this feature had been explained somewhere in either the instruction leaflet or on the B&M website.